NEW YORK (CNNMoney.com) -- Online sales on Cyber Monday surged nearly 20% from last year, according to findings from an analytics group released Tuesday. 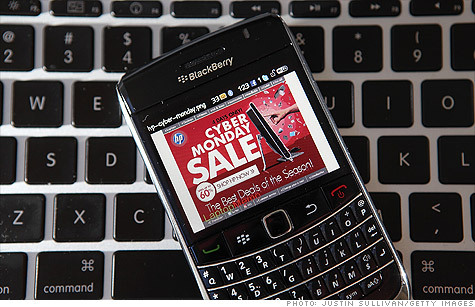 Cyber Monday online sales in the U.S. were up 19.4% in 2010 compared to last year, reported Coremetrics. More people were shopping online and the individual orders were larger than last year. Coremetrics said the average order value on Cyber Monday was $194.89, an increase of 8.3% from last year's average of $180.03. Cyber Monday sales also outdid this year's Black Friday online sales by 31.1%, according to Coremetrics. Shoppers also used mobile devices to make their purchases, with nearly 4% of all Cyber Monday shoppers using smartphones and other devices. Google (GOOG, Fortune 500)'s online blog reported that consumers increased their online shopping activity this holiday season and are more savvy in how they approach their shopping experiences. Mobile phones play a key role. "People are using their mobile phones to compare prices, look for store locations and inventory in stock locally and find deals," read the Google blog. The blog said that 52% of U.S. smartphone users plan to use their phone to compare prices during the holiday season and 40% plan to read product reviews on their phones.